Emily Mary Osborn was among the most successful Victorian women artists. Far from the well-trodden academic route followed by her male contemporaries, Osborn pursued her training with resourcefulness and tenacity, taking evening classes and persuading one of the teachers to give her private lessons, and then going on to study and work in his gallery. Though success did follow, with regular exhibitions of her work at the Royal Academy and sales enabling her to set up a studio of her own, as a woman in the male-dominated world of the art market, Osborn must have been only too aware of the obstacles facing women artists. As a woman she was never granted membership of the Academy and could not study in the Royal Academy schools (women were admitted in small numbers after 1860). More generally, though, Osborn, like many of her contemporaries was deeply concerned with the issue of educational and employment opportunities for women. It is a recurrent theme in her work and is perhaps nowhere better illustrated than in her most famous painting, Nameless and Friendless. 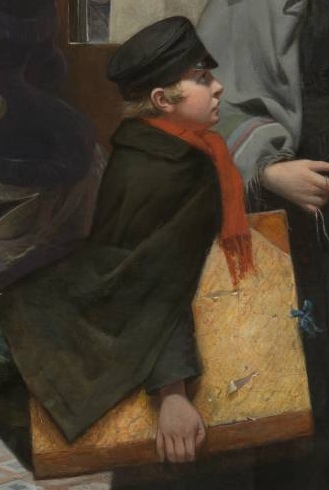 A woman stands in a print-seller’s shop, beside her a boy, her brother, stands carrying a portfolio under his arm. The black dress and hood she wears tell of a recent loss. 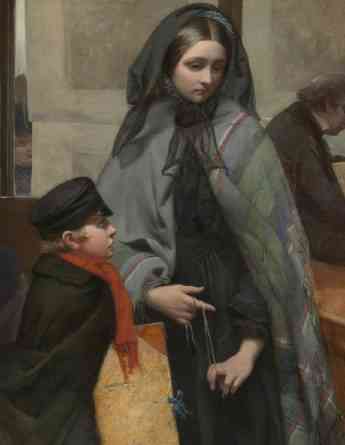 She is not wearing a mourning ring though, so she and her brother are probably orphans. Behind the counter to the right is the print- seller, a portly gentlemen, inspecting a small painting, a still life perhaps—the genre that, through lack of access to the life model, tended to be favored by women artists. The anxious pose of the woman, her downcast eyes, her left shoulder coiled inwards as though guarding herself against the dealer’s critical gaze and the way, too, her hands toy nervously with a length of string, may lead us to assume that the painting is her own work. Her defensiveness is justified. The chair to the right is empty, the dealer having made no attempt at courtesy by offering her a seat. In the doorway another woman and boy make their way out, some rolled up sheets under the arm of the latter, while outside in the rain a woman is just visible walking along the pavement sheltering herself with an umbrella. 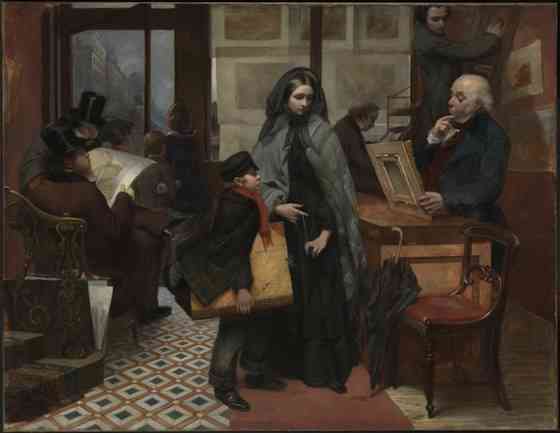 Like a continuous narrative (where we see more than one moment of time within a single canvas), do these peripheral figures hint at what awaits the woman and her brother, who, failing to sell her work, will soon be back walking the street? The orthogonal lines in the painting would seem to support this view, pointing conspicuously to the door as they do. So too, of course, does the title of the work, Nameless and Friendless, suggesting that without the necessary connections, a woman artist stands little chance of finding professional success. 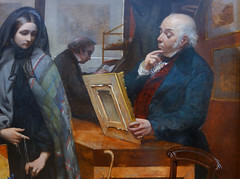 A possible literary source for the painting is Mary Brunton’s novel Self-Control, first printed in 1810 and re-published in the 1850s, which tells the story of Laura Montreville who tries unsuccessfully to sell her paintings in order to help save her father from financial ruin. In one chapter of the novel Laura visits a number of print-sellers in the hope of selling her work, but each time is disappointed. 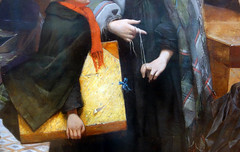 On her fourth attempt, a young man, a former artist himself, admires her painting and agrees to hold it in his shop on a sale or return basis. Perhaps, if the book was indeed the source of the painting, Osborn had this fellow in mind when painting the man on the step ladder. The way his face echoes the woman’s hints at a certain sympathy between the two, while his elevated level suggests that his vision extends beyond the myopia of his colleagues, one of whom sits wearing glasses scratching away with a pen at a ledger. The title carries a quotation from the Biblical Book of Proverbs: “The rich man’s wealth is his strong city: the destruction of the poor is their poverty” (10:15). 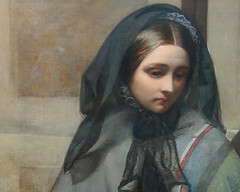 The passage goes on to develop the theme of the spiritual poverty of the rich, who complaisantly forget about God, a sentiment with which the Victorians would have been very familiar. The “strong city” of London was witnessing an extraordinary expansion as a result of the Industrial Revolution. For some this was an enormously prosperous time, for the working class and for those on the margins of society, however, living conditions had never been worse and without any form of welfare a change in fortune could easily see you ending up not just nameless and friendless, but homeless and penniless. Without adequate opportunities for gainful employment, single, middle-class women were among the most vulnerable. By quoting scripture, Osborn perhaps is encouraging us to read the painting more universally than as the depiction of a struggling woman artist: the point being that the great divides operating in Victorian society between the haves and the have-nots (what the Victorians called the “two nations”), as well as men and women, make us all the poorer. 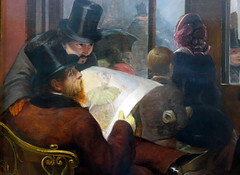 The quotation might also tempt us to a religious reading of the painting. The woman herself, though clearly outnumbered and surrounded by men on all sides, still dominates the composition—the implication being that though meek and mild, spiritually she is the strongest. For some, the problem with Osborn’s painting is that the woman is presented as too passive, too willingly accepting of rejection, too much of a martyr to male prejudices and male desires. Rather than breaking down the gender divide, then, the painting instead seems to perpetuate it. As valid as this argument is, as an early or proto-feminist painting Nameless and Friendless offers one of the most forceful examples of a women artist making a clearly articulated stand on one of the central social issues of the day. The painting is an image of its time, one that expresses the contradictions within Victorian society as well as its appetite for the mawkish. 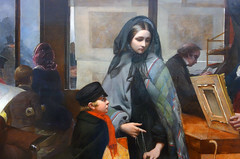 Like a character from a Dickens novel, the distressed woman artist is indeed sentimentalized, but like Dickens, Osborn does this not simply for effect, but to awaken her audience to the real and urgent need for social change. *Linda Nochlin, “Why are there no Great Women Artists,” as published in ARTnews, January 1971. Cite this page as: Ben Pollitt, "Emily Mary Osborn, Nameless and Friendless," in Smarthistory, August 9, 2015, accessed April 23, 2019, https://smarthistory.org/emily-mary-osborn-nameless-and-friendless/.